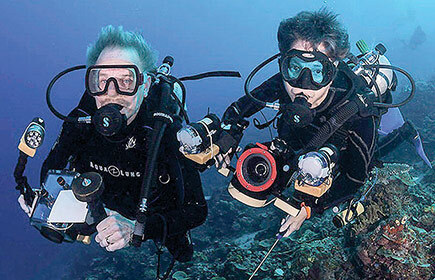 From left, Mike and Ellen Garvey have photographed the depths of the Caribbean and other waters. Sundays at Two will continue at 2 p.m. Sunday, February 10, at Lancaster Community Library, 16 Town Centre Drive, Kilmarnock. Ellen Garvey will present “What’s Down There,” reported committee member Lovey Long. Garvey will show underwater photographs and videos from warm waters around the world. As scuba divers and nature enthusiasts, she and her husband, Mike Garvey, escape the cold winter weather of the north to travel to a warm location to scuba dive and photograph. It’s not just fish, says Garvey. Their favorite type of diving is strange and tiny creatures—such as a pygmy seahorse, no larger than ¼ inch. With video they can capture the interesting behaviors such as the relationship between a blind shrimp and a goby. The shrimp maintains the home and the goby keeps watch. At the other end of the spectrum they have been diving with mantas, turtles and sharks. The presentation will include content from the Caribbean, several places in the Pacific, the Maldives and the Galapagos…..